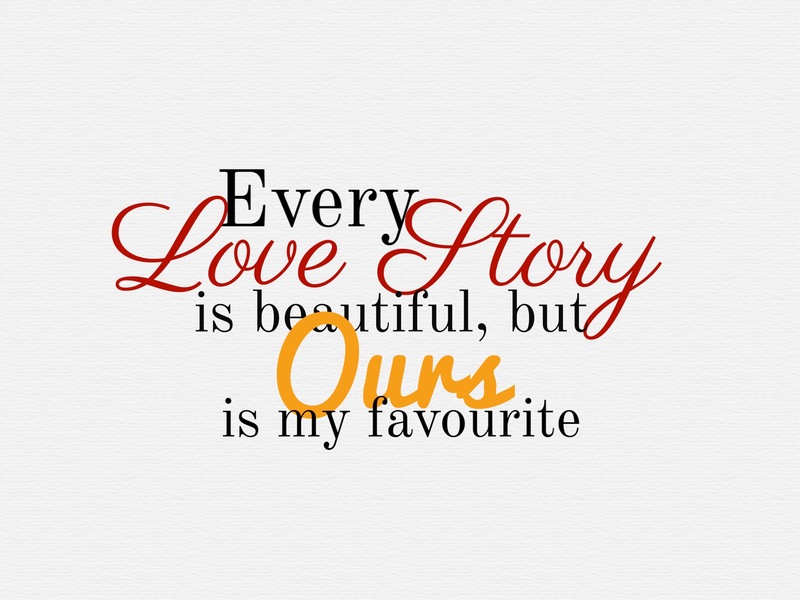 I made a Valentine’s Card for my lover, and I’m pleased enough with the result that I’d like to share it with you. Since it’s me making it, it’s partially knitted, of course! One pair of 2.25mm needles. All measurements are given horizontal width first, then vertical length. The back of the card with sunlight streaming through. 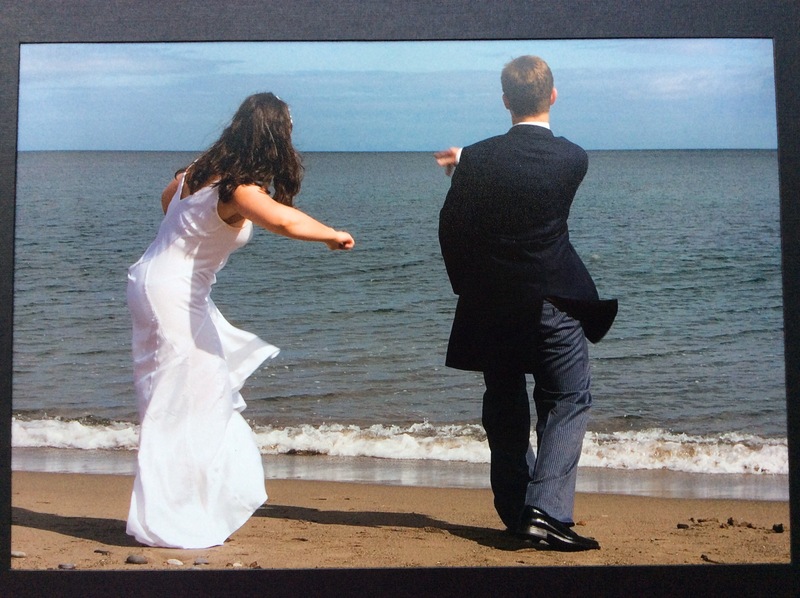 My lover and I skipping stones on Killiney Bay once upon a time. Rows 1 – 7: Knit. Row 8 and all WS rows to Row 38: K4, P25, K4. Rows 9 & 11: Knit. Row 13: K15, K2tog, Yo, K16. Row 15: K14, K2tog, Yo, K, Yo, Ssk, K14. Row 17: K13, K2tog, Yo, K3, Yo, Ssk, K13. Row 19: K12, K2tog, Yo, K, Yo, Cdd, Yo, K, Yo, Ssk, K12. Row 21: K11, K2tog, Yo, K7, Yo, Ssk, K11. Row 23: K10, K2tog, [Yo, K, Yo, Cdd] twice, Yo, K, Yo, Ssk, K10. Row 25: K9, K2tog, Yo, K11, Yo, Ssk, K9. Row 27: K8, K2tog, [Yo, K, Yo, Cdd] 3 times, Yo, K, Yo, Ssk, K8. Row 29: K8, LDC, Yo, K3, Yo, K2tog, K, Ssk, Yo, K3, Yo, RDC, K8. Row 31: K9, LDC, Yo, K, Yo, RDC, K, LDC, Yo, K, Yo, RDC, K9. Row 33: K11, P3, K5, P3, K11. Row 35 & 37: Knit. Rows 39 – 45: Knit. 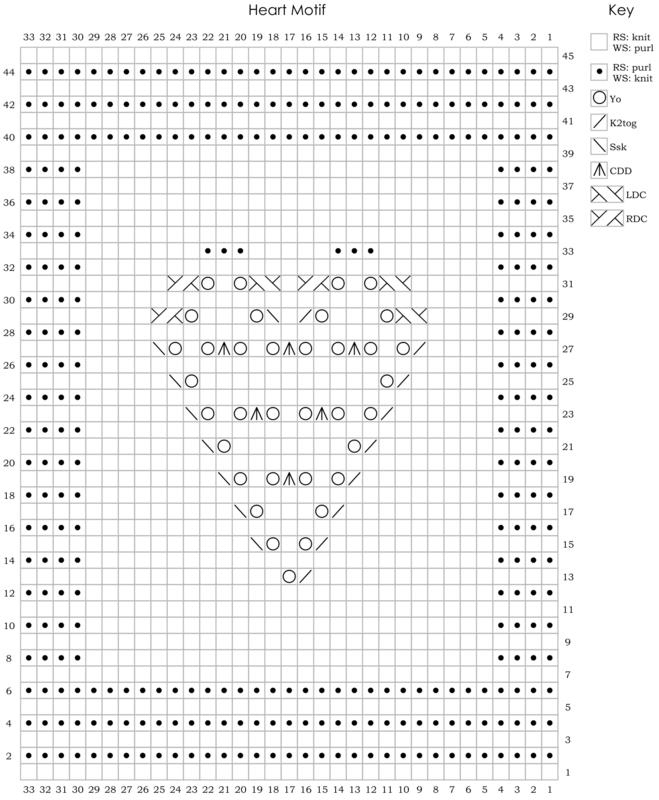 This motif is also charted in full. Read RS rows from right to left, and WS rows from left to right. Block gently, following the care instructions on ball band. Weave in ends. 1. Take the decorative card and cut a piece 13.5x15cm (5.5x5in). 2. On the reverse of the card, mark out a square 6.5×6.5cm (2.5×2.5in). Centre the square on the horizontal. Position the top edge of the square 4cm (1.5in) from the top of the decorative card. 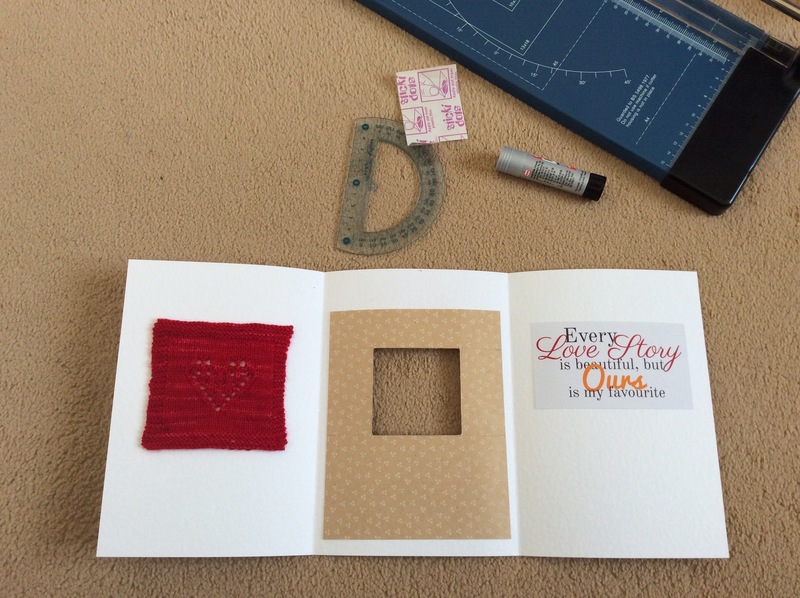 Use a scalpel to cut the window from the decorative card. 3. 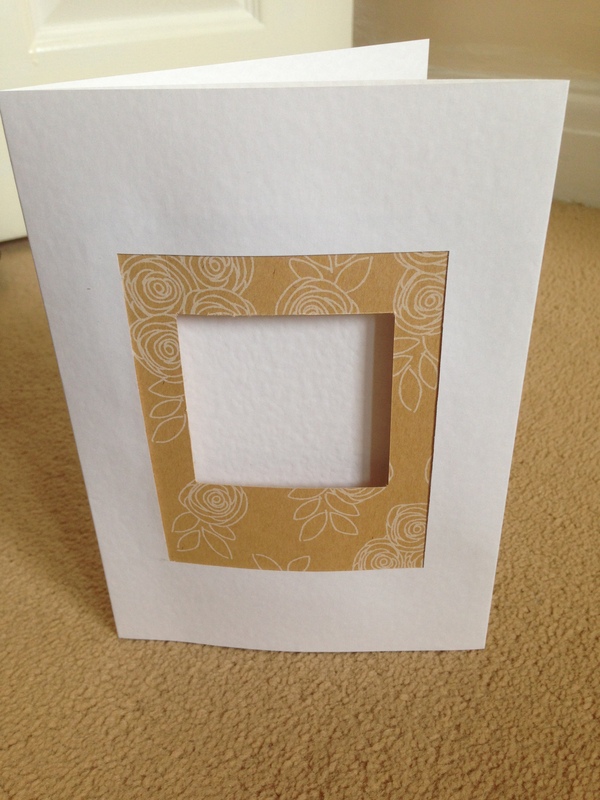 Glue the decorative card to the inside of the greetings card on the middle panel, to give a “frame-within-a-frame” effect. Take care to keep the edges straight so your frames dont look wonky! 4. 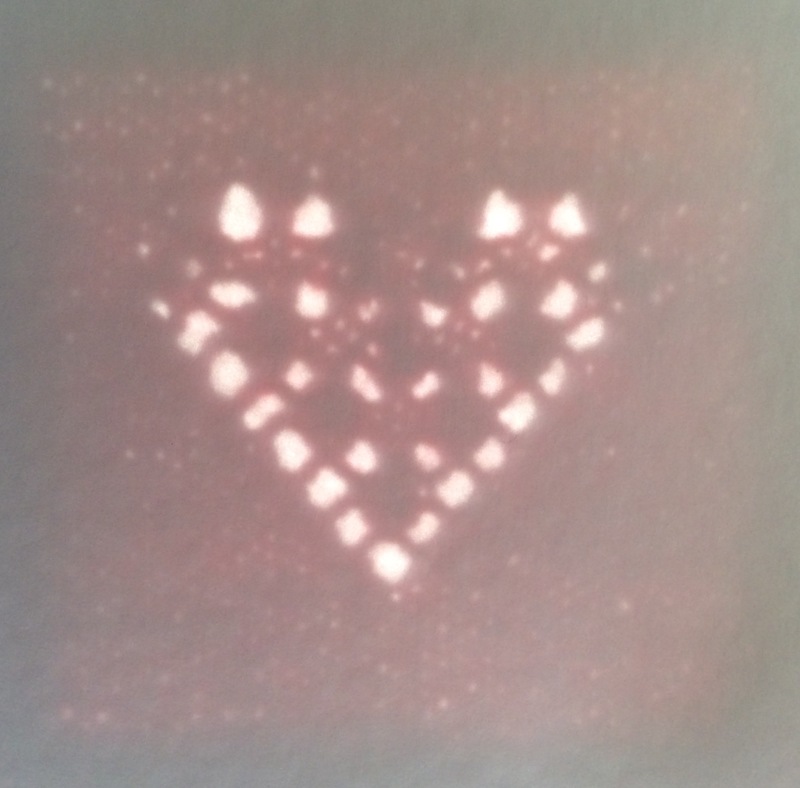 Use glue dots to stick your knitted heart to the inner flap that “looks through” the window in the front of the card. Put a glue dot at each corner on the WS of knitted motif. Position it neatly at the window. Close the card, thereby sticking it to the card’s inner flap. 5. Print out a motto (save my one below, or write your own) and glue it to the inside of the card. 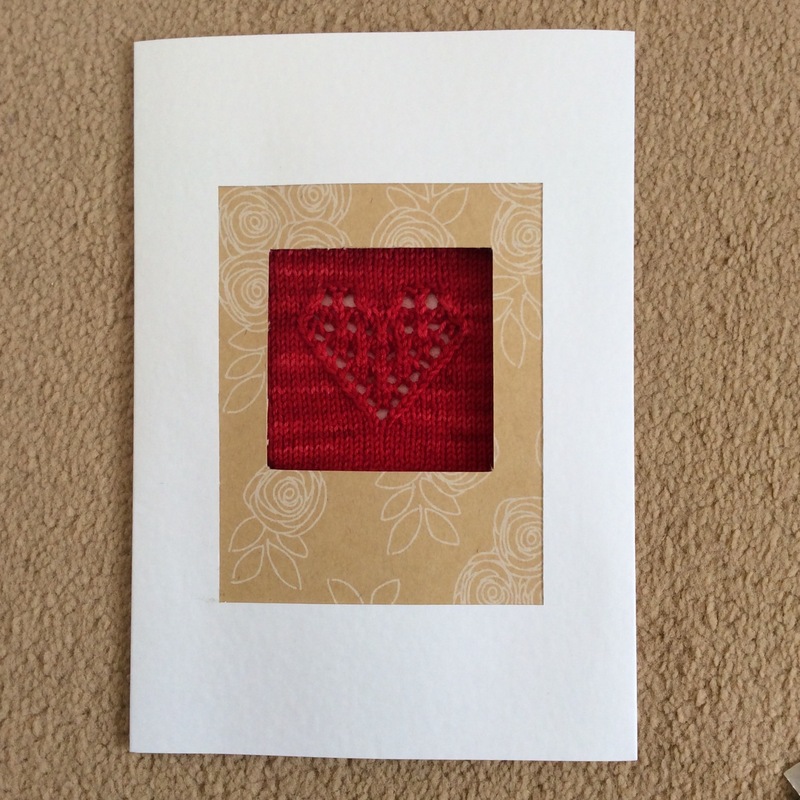 Use glue dots to stick the knitted motif to the card. 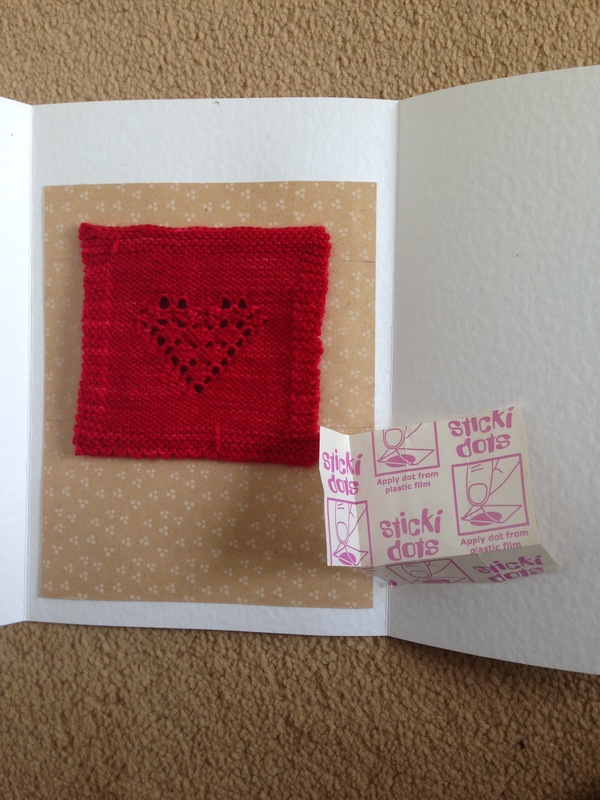 The knitted motif is attached to the interior flap of the card. The assembled card. 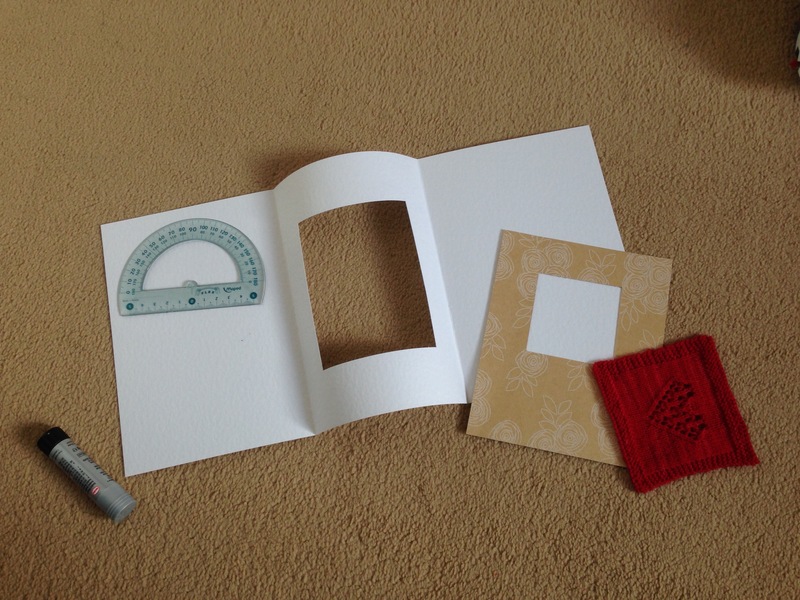 Note the decorative card is printed on both sides. Download for your own use, or make up your own! Seaglas on the cover of Knit Now 35! Images courtesy of Practical Publishing. Seaglas is a sheer, crop top, with seafoam panels at hem and sleeve caps and a sheer stocking stitch ground. Seaglas is bang on trend for Summer, as it’s thistle-down light. It’s knit with gorgeous Fyberspates Scrumptious Lace, which is buttery smooth to work with. You only need 2 skeins, too, and only a scrap of the second! Actually, the total weight for the sample was less than 60g (for size Small), so one skein might even cut it, if you would prefer a monochrome version. To knit Seaglas, start with the Seafoam lace hem. This is worked sideways on, and creates a column of YO’s on the very edge. 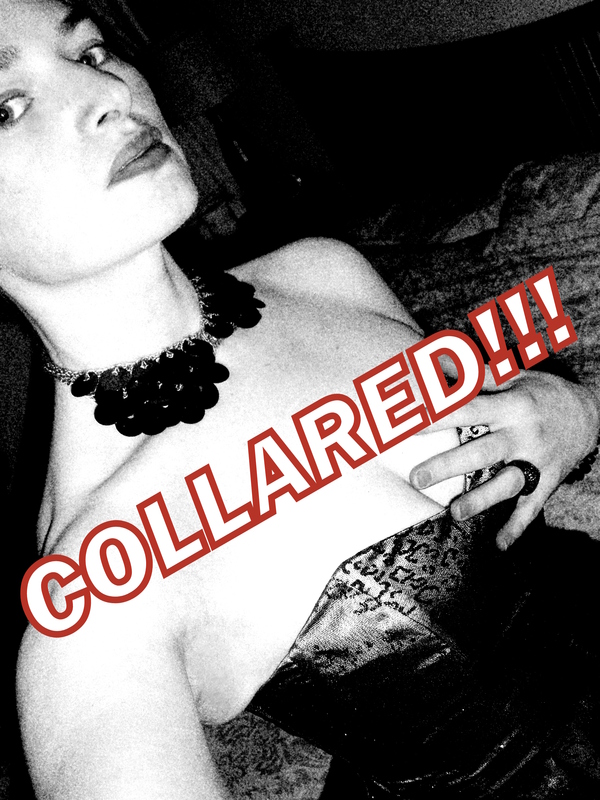 Then, pick up from the edge and work straight up to the neckline in stocking stitch. The neckline is a simple YO pattern within a garter st ground. 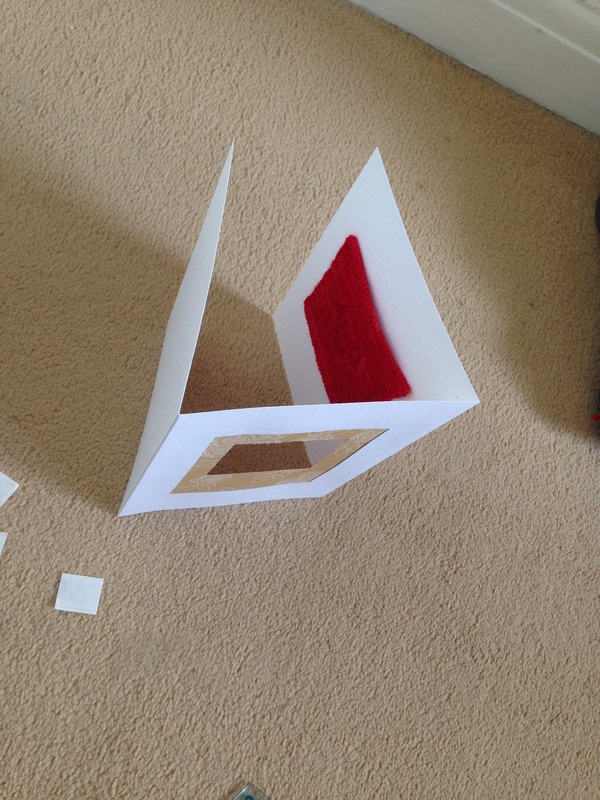 The back is worked in a very similar way. Last of all, the sleeve cap edging is picked up from the side of the top and worked all the way around the armhole, tapering at the start and end. I was absolutely stoked when I saw Seaglas was going to be on the cover. This is my second ever cover, the first was Crystl from Issue 33. I have saved the printing proofs of these covers carefully away and I intend to get them framed for the glory wall in my “studio” – a little private space I’ve carved out for myself in the house. This light little lace shawlette is quick to start, with just enough challenge to keep you interested. It uses up as much yarn as possible from that special skein of hand-dye you’ve been saving. Kaava features a beautiful open band of Shower Stitch, an old French lace pattern. The lacy rib section frames the shawl and a nifty crochet bind-off adds the final castellated touch. I love the phrase “to be swept off one’s feet”. It’s been running through my head since I was at the wedding of a beautiful Irish girl (whose name I’ve jumbled up for this pattern) and a very witty man earlier this year. I couldn’t tell you who did the feet-sweeping between the pair of them, but this shawl is what I plan to be wearing when my own feet next get swept under! A wide, crescent-shaped shawl that is ideal for showing off a skein of glorious hand-dyed 4-ply yarn. 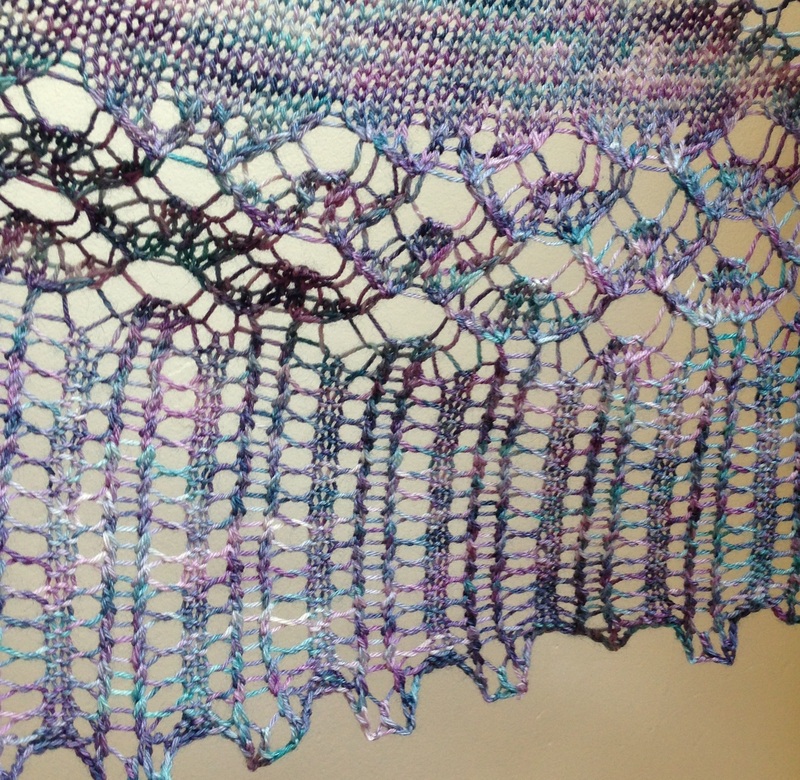 The shawl features Shower Stitch, which is a beautiful old French Lace stitch. A wool-rich yarn is recommended as this shawl needs to be blocked aggressively to bloom to best advantage. Shamu Makes Hand-dyed British Blue-Faced Leicester (4-ply; 100% wool; 400m/438yds/100g skein). Colour: mauve/denim, 1 skein. 20 sts and 36 rows to 10cm/4in over stocking stitch, relaxed after hard blocking. 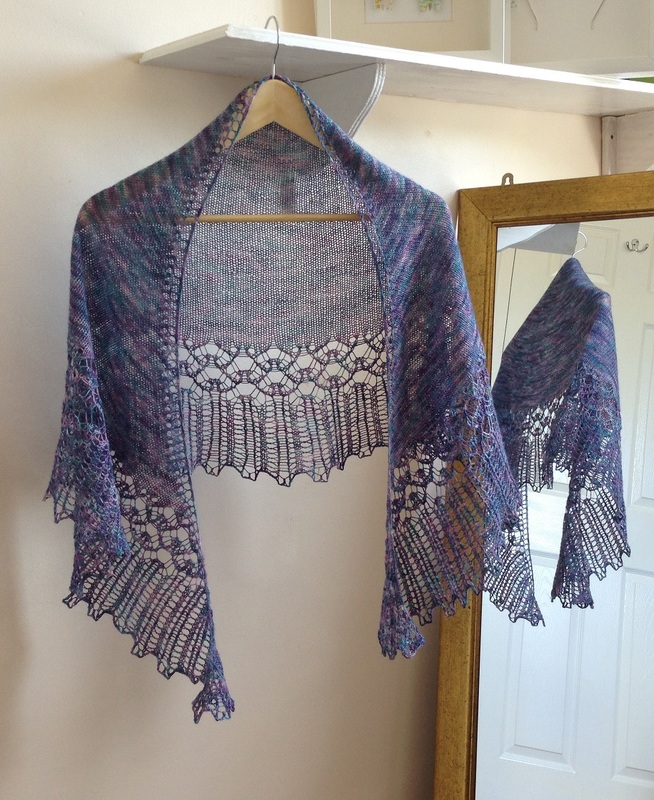 Kaava Shawlette – Testers Needed! Here’s a shawlette that’s a little bit of a challenge, but in manageable doses. The Kaava shawlette is knit flat, top-down, starting with a garter st tab CO. Then there are three featured sts: st st, shower st (a double-sided lace) and Lacy Rib (which is a super simple one-sided lace). Then a crochet bind-off gives the shawl edge the appearance of a clockwork cog. I’m looking for testers now, so drop by the Free Pattern Testers group if you’re interested! I’ll put a link here when the request is approved.